Black Friday is rapidly approaching and we're pumping out more tools to help you have a great rest of the year. 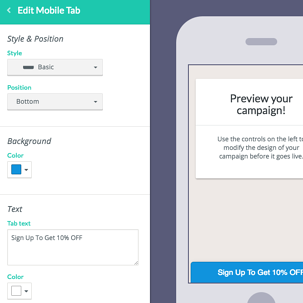 This month we've given you some new design, targeting, and email options. Read on for the details! 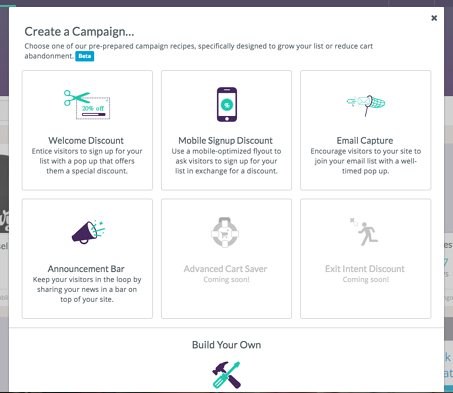 Create display campaigns from pre-built recipes: When people first get started with Privy, they often want to know exactly what to build. So we decided to pre-build a bunch of campaign types that have been proven to work. We’ve started with four great campaigns and there are a lot more to come. 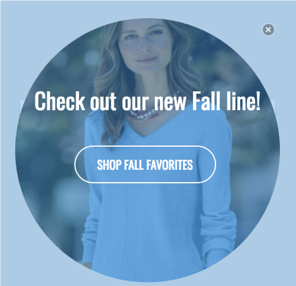 Just click “create new campaign”, choose your recipe edit your design and settings as necessary, and get it live on your site in just a few clicks. Learn more. Add Link Buttons and Custom HTML to Bar Displays: In the past, you could only use bars to collect email addresses or show text to visitors to your site. Based on feedback from lots of Privy users, we’ve made a few changes to give you more control over what goes in your bar displays. Starting today you will be able to add and remove text, add a link button, and use custom html (Commerce plan and higher) in bar displays to help you drive a wider array of behaviors on your site. 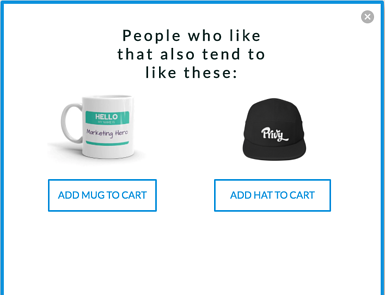 For example, you can feature a product with an add to cart button or promote a collection-specific sale that drives visitors right to that product collection. 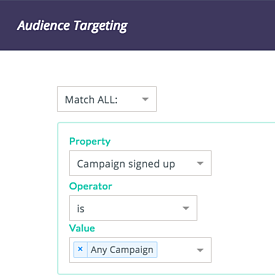 All or Nothing Campaign-Based Display Targeting: In the past if you wanted to show a pop up or other display only to users who have never signed up for any campaign before you would have to check off every campaign you have ever created. Not awesome, right? Now, our Commerce level and up users can show a campaign only to visitors who have never seen any campaign or never signed up for any campaign with a single click. Much simpler! Control mobile and desktop tabs separately: In the past, if you were using tabs to let people manually trigger your displays you had to choose a tab location (e.g., top corner, floating, middle bottom) that worked for both mobile and desktop visitors. We realized that people wanted more control so you can now choose one tab location for people on their mobile devices and a different location for those visiting from a desktop computer. 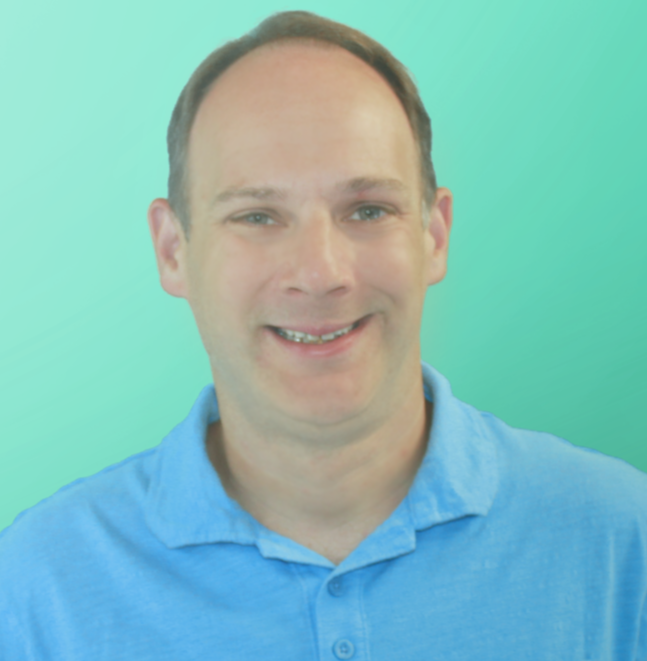 Add video and social links to your emails: We love our email editor because it provides a ton of flexibility to design beautiful autoresponders, newsletters, coupon reminders, and other emails. 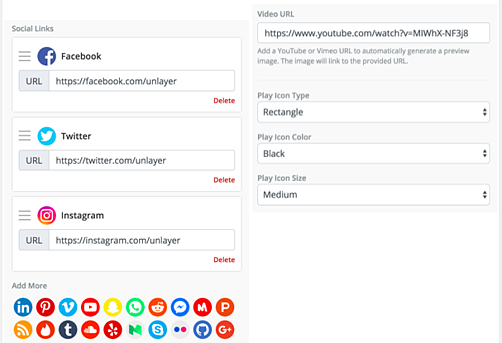 But two things that were missing were the ability to easily include videos and insert your social icons as elements. Now we are adding both and hope you’re thrilled, because we are! We’ve added the ability for our growth customers to target their displays based on the actual products that are or are not in a shoppers’ cart. This is great for upsell pop ups, product or collection specific promotions, and more. Learn more. Also new this month for our growth level customers is the ability to target pop ups and other displays based on custom field responses you have captured via a Privy form. For example, imagine showing a blue sweater promotion to people who have told you that their favorite color is blue and a green sweater to promotion to people whose favorite color is green. Learn more. We just released a new “Order Count” targeting rule for Growth customers on Shopify, Shopify Plus, and BigCommerce. This will allow you to target displays based on the total number of orders a shopper has placed in your store. Using operators such as ‘less than’, ‘less than or equal to’, ‘equals’, ‘does not equal’, ‘greater than or equal to’, and ‘greater than.’ you can now create rules like only showing a display to shoppers who have never purchased, or showing a special discount or promotion only to shoppers who have purchased more than 5 times. Now you can more easily create different on-site strategies for potential customers, new customers, and your most loyal customers! Learn more. 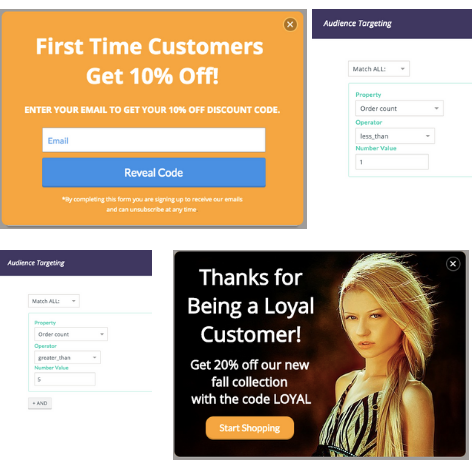 We just launched a Beta version of our new abandoned cart emails for Shopify and BigCommerce stores. Now you can easily trigger emails when a known visitor to your site adds something to their cart and leaves without purchasing it. Using our fully flexible email editor you can set cart minimums and timing thresholds to send one or more emails to save more carts. Learn more. As a marketer you want to know what is and isn’t working at a glance. That’s why we’ve begun overhauling our email reporting by adding graphs to show how your newsletters are performing. 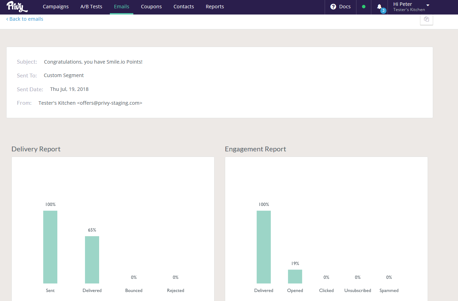 And we’ll be adding more email reporting over the coming weeks. Learn more. Interested in our Growth plan? Schedule a demo here. Want to learn more about our Email Automate Plan? Click here.